One of my favorite movies is “The Princess Bride”. As Buttercup and Wesley are making their way through the Fire Swamp, Wesley falls into a pool of quicksand and is under for quite some time. (As a child, I used to try to hold my breath for the amount of time that he was underground just to prove it was possible.) After an ROUS (Rodent of Unusual Size) waddles across the quicksand, Wesley emerges from the quicksand with a giant gasp. 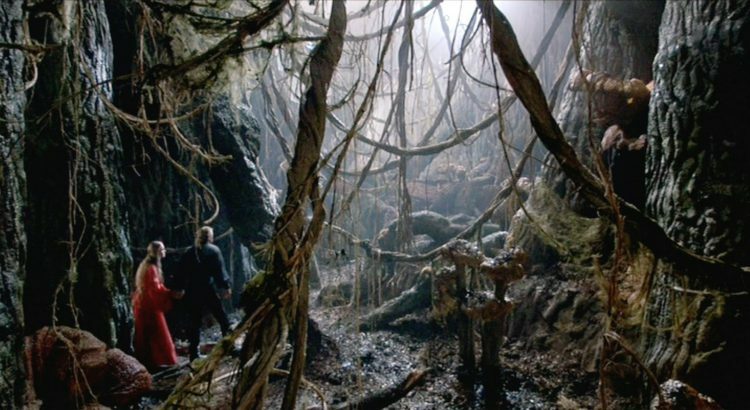 Trying to sustain your drive through a task, a project, or even a career can sometimes feel like pulling yourself out of a swamp by your own hair. We seem to have a natural aversion to persistent effort that no amount of caffeine or inspirational posters can fix. In this article, she discusses some great, tangible ways to keep you going when you just don’t want to. Specificity: goals should be specific, not general. For me, my world revolves around billable hours. It’s easy for me to say, “I want to make $X a month” but that can’t happen if I spend every day writing blog articles and balancing the company checkbook and having lunch with colleagues and doing any of the many other, very worthwhile things I could with my time other than doing work that clients will pay me for. However, I do need to do some of that. 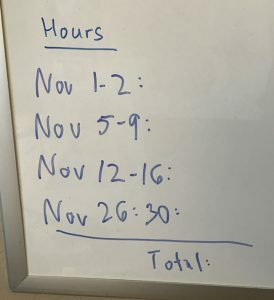 So, for me I came up with a very low-tech motivational strategy: I write how many hours I’ve billed per week. It means that spread out over a week I know I need to average so many hours a day, but if I have one day that’s lower, I feel like I can balance it out over the course of the week. And the monthly total helps me know if I’m on track or not. Focus on the elements of the task you do enjoy: if the overall task feels like drudgery, focus on the things you do like about it. Although documentation doesn’t have to be terrible, on some days, I know my whole day is going to be spent writing documentation. It has the feel of a college term paper to it. On those days to will myself to work, I might treat myself to a day at the coffee shop or sitting in my office with a scented candle and soothing music and a cup of something warm next to me. (Coffee, maybe?) Or in the summer, sitting on my porch. If the work stinks, maybe the surroundings can be happy. Finding effective rewards: while intrinsic motivators are better motivators overall, extrinsic ones can be effective. 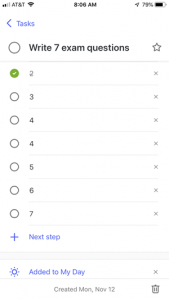 “Gamify” yourself by promising yourself rewards after certain tasks are complete. However, beware cases where the reward backfires, such as completing tasks so fast that they’re done poorly, or rewarding yourself with the opposite of what you were working towards. (For example, eating a candy bar as a reward for working out, or promising yourself a day off after you put in those extra hours.) Counter-intuitively, another tactic can be to determine a negative consequence for not accomplishing your task, such as having to pay a fine in a fine jar or having to donate money to a cause you hate. Sustaining progress: We all have a tendency to have a burst of energy at the beginning and end of tasks but get bogged down in the middle. Breaking tasks into smaller chunks helps. At the beginning when you see how much is left before you, focus on how many tasks you have already done to reassure yourself you’re making progress. Toward the end, focus on the remaining items and how close you are the goal. This one is very familiar to me. When I was younger, I was an amateur distance runner. (I ran very few races but liked to run for fun as my exercise.) At the beginning, I would count the minutes or miles down, and toward the end I would keep my eyes on how many minutes or miles were left to complete my workout. Same idea. You can’t get much done in life if you only work on the days when you feel good. 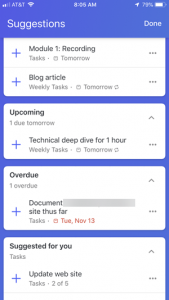 Task lists can work both ways. On same days they can motivate me, but on other days they can make me feel like my life is reduced to an endless task list. That being said, on my better days I find that a good task list helps me see the forest through the trees; instead of focusing on the elephant, I can focus on which bite needs to be taken today, so I can press through the Fire Swamp days. 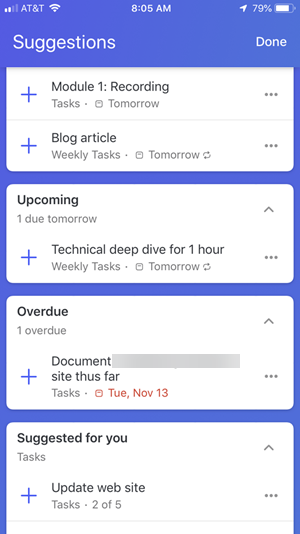 I have personally found Microsoft’s To-Do app incredibly helpful in keeping me focused and motivated each day. 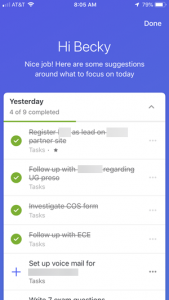 The core of the app is a screen that lets you prioritize tasks for any given day. Each day, at the start of my day, I decide what I want to work on. Does it have a due date? Are there multiple steps to the task? Does it have a description? 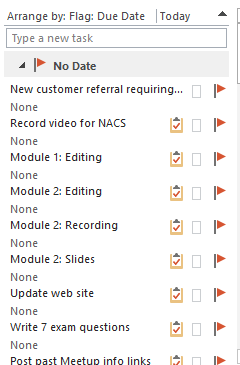 As I complete my tasks, I simply click on the task to mark it completed. 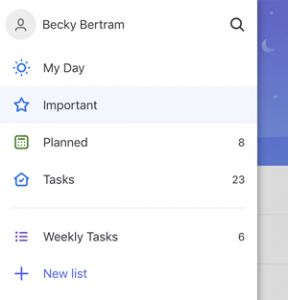 I can choose to sort the view of “My Day” (or any task list) according to criteria such as creation date, due date, importance, alphabetically, or manually. If you’re like me, you almost never complete all the things you planned on doing in a day. 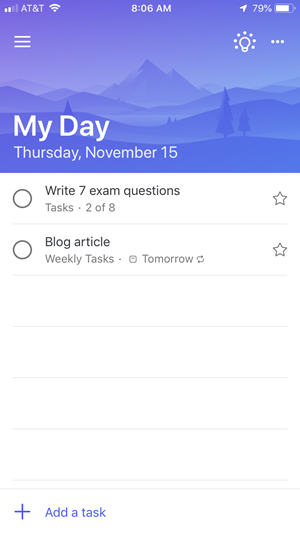 The next day you pull up an app, it will show you what you didn’t complete the day before, and you can click the “Add to My Day” all over again, so now it is a to-do item on this new day. 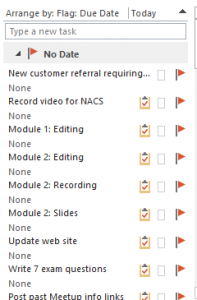 Additionally, it will recommend tasks from other lists, or tasks with due dates that have passed or are upcoming. You can also create additional lists for yourself and draw from the list for your daily tasks. 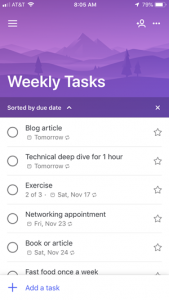 I personally have a generic “Tasks” list that I add items to as I think of them. 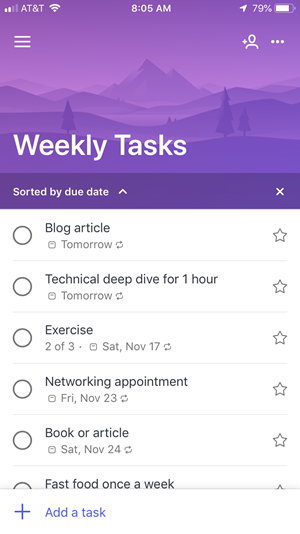 I also have a “Weekly Tasks” list that includes general tasks I’d like to accomplish every week, just to say well-rounded and healthy. (For instance, I have a bad habit of running to McDonald’s for lunch and I try to keep that in check by only allowing myself to do that once a week!) I also try to fit things in like reading a book or article about general business stuff, as well as trying to learn something new technically. If I want to add a task to my day, I simply open the task and click on the “Add to My Day” button. 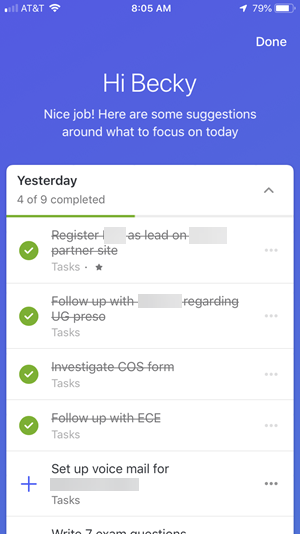 Now that I have all these tasks, I can switch between various views in the app. In terms of motivation, I like what was suggested in terms of breaking a task down to smaller pieces. Right now, I’m writing an exam and I have a deadline to write 7 questions by tomorrow. 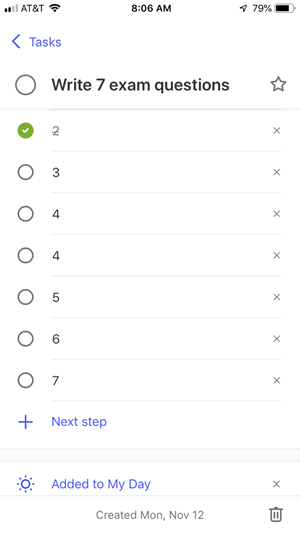 I’ve created a single task with seven steps. Each day I add it to My Day, but I know that all 7 need to happen by the end of the week. 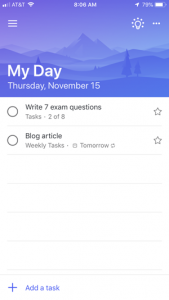 I have found the app quite easy to use and a great way to keep me on track each day. I’m curious, if you try the app or have been using it for a while, how do you use it? And how to do you find motivation on those days when you’re just not feeling it? Feel free to comment below!